← Jesus Sacrificed His Blood For You! Jesus Has Set You Free! While Jesus, the Son of God, was traveling about Jerusalem teaching the Jewish people about love, a rebel named Barabbas lead a group of political insurgents in a rebellion against Rome. Mark 15:7 A man called Barabbas was in prison with the insurrectionists who had committed murder in the uprising. It was during Passover and the Festival of Unleavened Bread when Jesus was arrested and brought before the Roman governor, Pilate. At that time, Pilate directly asked Jesus the question “Are you the king of the Jews?“. This important question referred to an earthly “king,” since Pilate was concerned another uprising against Roman authority was about to occur. Certainly, Pilate did not want any revolts during his post in Jerusalem. John 18:39 But it is your custom for me [Pilate] to release to you one prisoner at the time of the Passover. How ironic that Barabbas was the man the crowd wanted to set free. For he was indeed guilty of the crime of treason and should have stayed in prison. His actions clearly displayed him as an enemy to Rome. However the angry crowd did not care about Barabbas’ illegal actions against Rome. They may have even considered him their hero for standing against the government they hated. On the other hand, Jesus was arrested by the Jewish leaders for what they considered blasphemy and had charges against Him that meant nothing to the Roman government. That is why these so called “religious leaders” decided to lie. They knew the only way Pilate would allow Jesus to be crucified was if Jesus was hostile to Rome, so they made false charges against Him. The religious leaders continued to profess to Pilate that Jesus was committing treason. I used to believe it was not right that Barabbas was set free after the outright sins he committed. He did evil in the sight of God and should have been punished accordingly. Just like when God punished David and Bathsheba, by taking their first born son because they committed adultery and David also had Bathsheba’s husband killed. But because I now study The Word, I have come to realize – I am Barabbas, “son of Abba [Father]” . I am God’s adopted daughter! Adopted because of the sacrificial death of Jesus on The Cross. Barabbas was a sinner set free on earth because Jesus took his place. I am a sinner set free eternally because Jesus took my place. Yes I lie, I cheat, I steal, I hate, I gossip, I have impure thoughts, I covent what others have, I’ve led others astray, I am selfish. . .the list goes on. I have turned my back to Jesus many times and in many different ways, leading my own personal revolt against God. But because I believe that Jesus died for me on The Cross, because I believe He bore the massive weight of my shameful sins, my unrighteousness and my transgressions, I am set free, just like Barabbas was set free! Let Jesus set you free! Confess your sins to Jesus – believe that Jesus died for your offenses as He hung nailed to The Cross and you too will become an adopted “son of Abba”. Jesus Has Set You Free! – on Facebook. 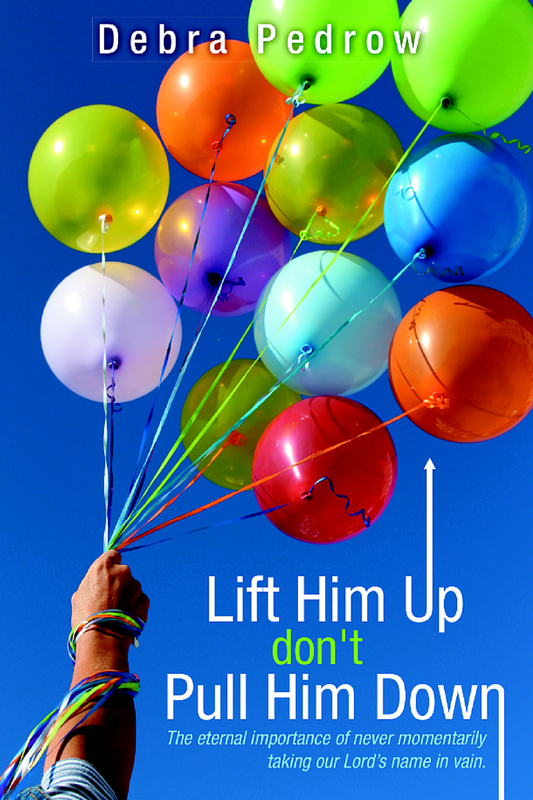 Order copies of LIFT HIM UP DON’T PULL HIM DOWN @ LULU.COM or AMAZON.COM for your next Bible study. Thank you. He has risen, indeed, for us! It’s very true so many of us have particular burdens. I have my MS, but my joy lies in Jesus for all He has done for me, not for what MS may take from me. I pray your husband has faith to find his joy in Jesus, also.